For freshmen Amity Malmquist (Tampa, Florida) and Madison Wright (Sioux Falls), Wednesday was all about networking. 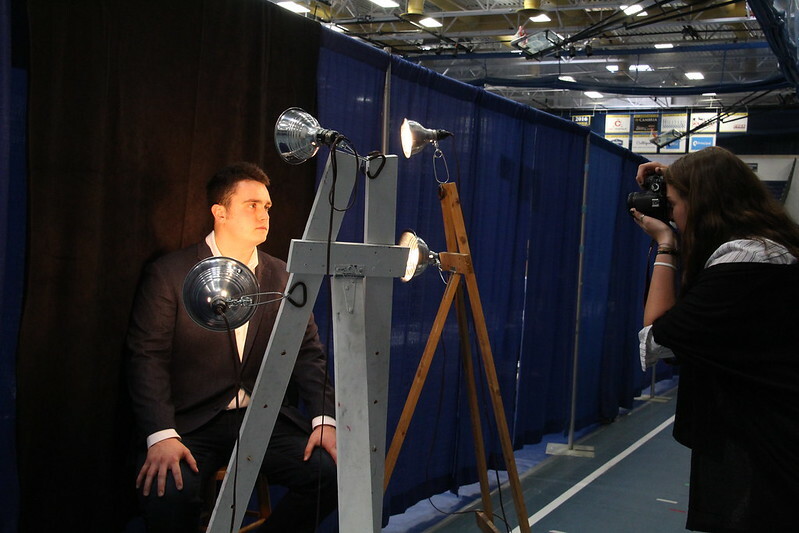 Malmquist and Wright were among hundreds of Augustana students who spent time meeting with area employers, volunteer organizations, campus groups, and study abroad agencies at the 2017 Augustana Experience Expo. Held in the Elmen Center, the event was sponsored by Augustana's Student Success Center, the Augustana Student Association, the International Programs Office and the Center for Campus Life. "It was a great opportunity to network and to practice how to start up conversations with (employers)." "I'm thinking of staying in Sioux Falls this summer because there are so many possibilities," Malmquist said. Wright, a nursing major, agreed. "I'm interested in volunteer positions and I got to talk with a (nonprofit) organization here that I'm really interested in," she said. Jacob Wargo '18 is a math major from Green Bay, Wisconsin. Thanks to help from his academic advisor, Dr. Martha Gregg (mathematics), and the Student Success Center, Wargo already has an actuarial internship with Sammons Financial Group lined up for this summer. He attended the Experience Expo to make additional connections for the future. "(My internship this summer) is what I want to do," Wargo said. "I think this event is just a great networking opportunity. It's really good that Augie puts this on." Kelly Wood '99 is an RN and MDS coordinator for the Good Samaritan Society in Sioux Falls. She returned to her alma mater on Wednesday to staff Good Samaritan's booth at the Experience Expo. "It's wonderful to talk with so many students from so many different majors and to learn where they want to go in their careers," Wood said, explaining that as an employer, the opportunity to meet face-to-face with prospective employees or interns is ideal. "It's a really easy way to connect," she said. Nickalas Smith Jr., a freshman from Winter Haven, Florida, also called the Expo a great opportunity to network. Smith Jr., a business administration major, is developing an app called StudyBuddy, designed to match students with fellow students based on personality type. At the Expo, he had a chance to visit with a software and engineering firm and learn more about their programming area. "This is just such a great opportunity for us, as students, to get our feet wet," he said.